The Autobots and Decepticons use Prime Masters to wield the incredible powers of the legendary bots who shaped the universe: the Primes. The Micronus Prime Master gives other bots the ability to link and share powers. How will the Autobots and Decepticons use this power-link ability? Anything is possible and everything is at stake when the Power of the Primes is unleashed! Transformers Generations Power of the Primes Prime Master figures is 1.5-inch-scale figures that work with other figures. 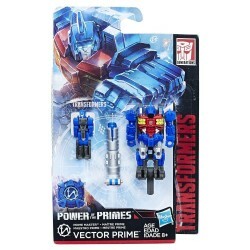 Attach this Prime Master figure to a Power of the Primes Deluxe, Voyager, or Leader Class figure (each sold separately) and imagine that bot wields the power of Micronus. 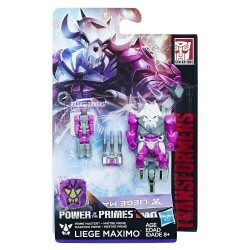 • Includes Micronus Prime Master figure with decoy armor, decoy armor weapon accessory, and instructions.